Spanish duo Mondträume are the latest addition to the impressive back catalogue of synthpop bands fostered by the Alfa Matrix roster. With their mix of downbeat vocals and huge dance inducing melodies they are akin to not only the household name bands such as Depeche Mode and The Pet Shop Boys, but also acts like Covenant, Melotron and Pride And Fall. The début EP is a fine manifesto of melancholic vocals, hard dance beats and memorable melodies. The title track kicks things off with a pure synthpop approach that is half 'Enjoy The Silence' and half 'It's A Sin'. The b-side, 'Parasite', continues down a dancier path courtesy of a Terrolokaust remix. It 's harder and arguably likelier to get more club play than the title track which is a solid choice to close a live set. The EP is then rounded out by two further remixes of the title track. The first comes courtesy of Cosmic Armchair who imbibe it with the same club appeal as the previous track. While Electro Spectre go down a much more laid back path for some more introverted listening. 'Life Is Short' is a fine first offerring from what will undoubtedly become a regular name on the synthpop circuit. 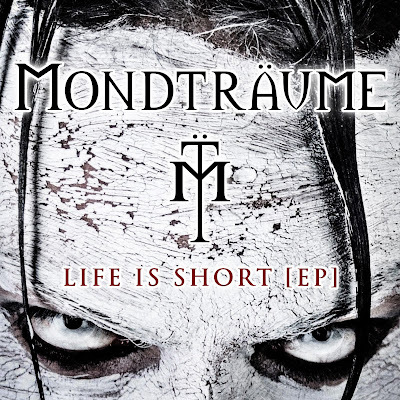 However it remains to be seen whether Mondträume have the goods to pull away from their label mates and inject something fresh into the scene.